REDFERN: The historic 40,000 Years is a Long Long Time (40,000 Years) mural at Redfern station is one step closer to being restored after funding grants were approved by UrbanGrowth and NSW Community Building Partnership program through Newtown MP Jenny Leong. The Redfern Station Community Group (RSCG) has been campaigning to restore the ageing mural since 2013. RSCG convenor Desley Haas acknowledges the previous attempts over many years to attract funding to restore 40,000 Years by the artist Carol Ruff, Sara Hamilton and the National Centre of Indigenous Excellence, and the Aboriginal Medical Service Redfern. RSCG’s is by no means the first attempt. Ms Haas said that while she is proud of the network of organisations that has formed to protect and promote the mural, “It’s ridiculous that [the restoration campaign] has gone on this long.” She paid tribute to the local residents, volunteers and organisations like the City of Sydney Council and its Redfern Neighbourhood Service Centre and Redfern Community Centre, the Aboriginal Housing Company, the Metropolitan Local Aboriginal Land Council, Eora College – Sydney TAFE, Sydney College of the Arts – Sydney University, Counterpoint Community Services and former City of Sydney Councillors Irene Doutney and Robyn Kemmis for their support over many years of organising and fundraising efforts. The RSCG was awarded an initial $10,000 Matching Grant by the City of Sydney in 2015 for a Feasibility Study into restoring the mural and for information boards, which are displayed beside it, about the mural’s history, present efforts and supporters for its future restoration. The next step for funding is to obtain a Creative and Cultural Grant from the City of Sydney for the balance of the funds required. “If we are successful, we hope to start the restoration in August,” said Ms Haas. Lyn Turnbull, also a member of the RSCG, said: “People realise the voices and presence of Aboriginal people in the area [are] important as does Council, which used a photograph of the mural on the cover of its Barani Barrabuga – Yesterday Tomorrow – Sydney’s Aboriginal Journey walking tours booklet. We just need Council’s backing for its restoration.” She points to the fact that the mural has not been heavily tagged as a sign of the community’s respect and appreciation for the artwork. Aunty Donna Ingram leads walking tours of noteworthy sites in Redfern’s Aboriginal history. She said that the mural gives her a great sense of pride, and she aims to pass that on to the people she tours, especially young Aboriginal people. “I like to point it out because it looks so worn out. I don’t want people to look at it negatively… [I] make it clear how important it is,” she said. Aunty Donna has a personal connection to 40,000 Years – her uncle is a member of the Redfern All Blacks football team pictured on the mural. Other iconography includes the Rainbow Snake, the Aboriginal flag, the arrival of British tall ships, and the Stolen Generations. Newtown MP Jenny Leong, said the mural represents the “heart of Redfern”. “It is crucial that we ensure that the significance of Redfern as a site of strength, struggle and resistance for Aboriginal people remains at its heart,” Ms Leong said. Despite the many voices of support for the mural’s restoration, it is not part of the City of Sydney’s Eora Journey project, which celebrates Aboriginal heritage, and includes seven public artworks, curated by Aboriginal writer and curator Hetti Perkins. Fiona Lanigan argued that 40,000 Years should be included in the artworks because it has cultural qualities acquired over time that newer works of art may not have. “It has historical resonance as public art,” she said. City of Sydney Labor Councillor Linda Scott agrees, and has written to the CEO of the City of Sydney to ask whether 40,000 Years can be included. Neither councillor would speculate on the outcome of the grant application, however, both affirmed their personal support for the restoration. Councillor Scott said she was a strong supporter of street art and was proud to be championing a draft City of Sydney street art policy. She described 40,000 Years as “a crucial piece of public art for the city”. The RSCG’s Cultural and Creative Grant application will firstly be considered by council staff, who will make a recommendation to the City of Sydney’s Cultural and Community committee. The decision to approve or reject the application will be made by councillors at the committee meeting, where residents can attend and speak. If the application is successful, the restoration will be overseen by the original artist, Carol Ruff. She will be assisted by other local artists and art students. The RSCG is encouraging supporters of the mural restoration to email letters of support to the SSH by March 12, to include in their application for the grant application or directly to City of Sydney. CORRECTION: I (Fiona Lanigan) would like to rectify the incorrect information in the article ‘Mural restoration more than a heritage issue’ by Phillipa Clark in The Review, Art & Culture in Your neighbourhood (March ’17). 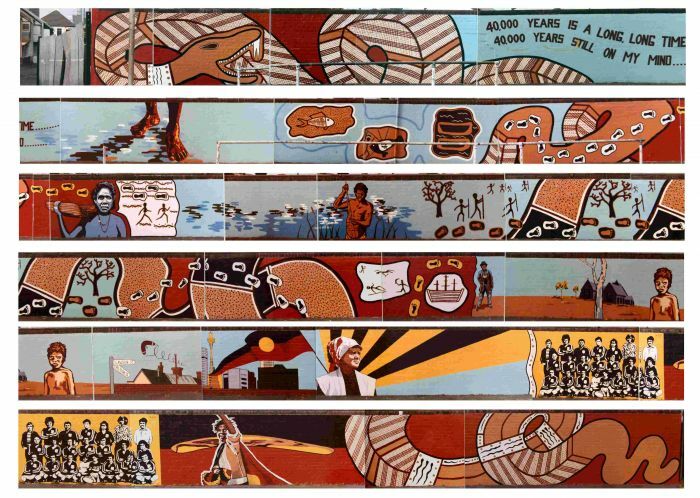 This article states that I argue that the mural 40,000 Years is a Long Long Time (40,000 Years), should be part of the City of Sydney’s Eora Journey project curated by Hettie Perkins. I have never stated or expressed this argument. I fully understand and support the Eora Journey as a Contemporary Aboriginal and Torres Strait Islander art project. The1983 mural 40,000 Years is historically significant to the Redfern community and I believe the city at large, which should be restored to acknowledge the past for the future.